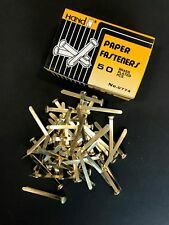 50 Quality Brass Plated Paper Fasteners Split Pins Butterfly Clip 51mm/2"
Italian Cast Brass Paper Clip, Hand Design, Polished Finish, Small, 4.5cm x 10cm, ICBPC/1. VINTAGE MINIATURE BRASS DESKTOP PAPER HOLDER / CLIP AN ELIZABETHAN GLOVED HAND OVERALL SIZE APPROX JUST OVER 3.25" LONG X 1.5" WIDE ROUGHLY CAST AND WITH AGE AND USE RELATED WEAR ALL INTACT AND COMPLETE AN ORIGINAL VINTAGE COLLECTABLE ALL IN GOOD WORKING VINTAGE CONDITION SEE AL PHOTOS. New listingVintage Brass Enamel Paper Money Clip - Egyptian Figure One Side, Birds Other. Brass clip with a strong spring - a money clip. Enamel on brass (cloisonné) excellent condition. 4” x 1.5” depth 0.75” Egyptian figure on one side, a pair of mythical birds on the reverse. Thanks for looking Dispatched with Royal Mail 2nd Class Large Letter. BRASS COLOURED. 17MM IN SIZE. Extra Information. Product information. 1930s I think. Nice brass clip - with a hole in the back for hanging. Brass golf club style paper holder clip or paperweight. 6" length. 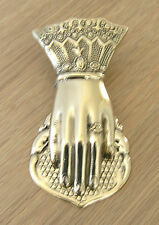 This is an ornate brass paper clip depicting a man and a woman.